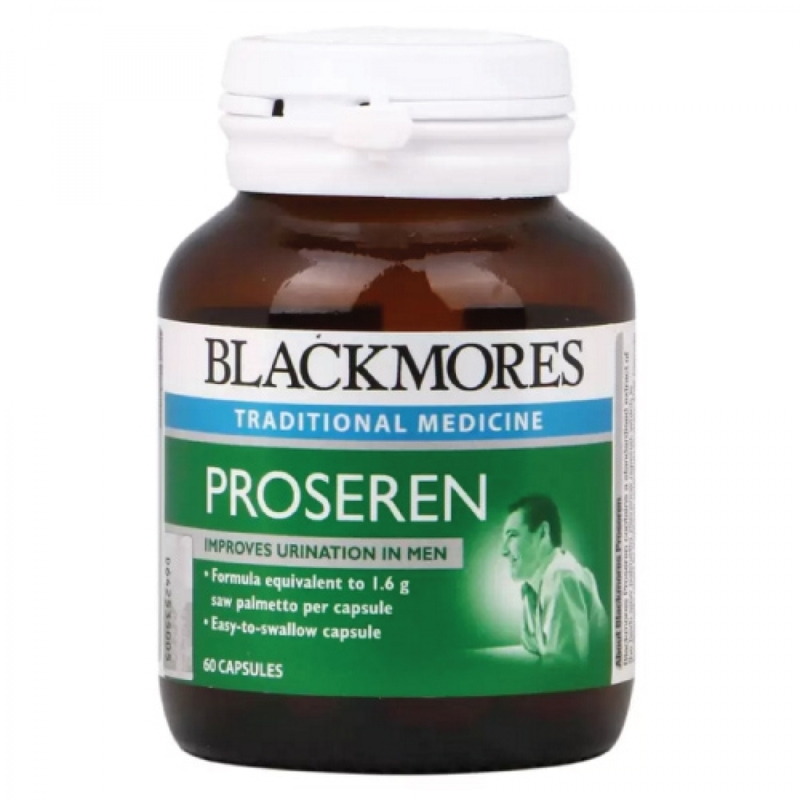 Blackmores Proseren contains a standardized extract of the herb saw palmetto (Serenoa repens), which is traditionally used to improve urination in men. This formula is ideal for older men with frequent day or night urination, difficulty in starting or finishing urination, or a weak urinary flow. Benign prostatic hypertrophy (BPH) is a slow progressive enlargement of the prostate gland. Symptoms include frequent urination (particularly at night), hesitancy and impairment of urinary stream. Results of clinical trials indicate that saw palmetto can assist in the relief of symptoms of BPH. Saw palmetto has been shown to improve residual urine volume and urinary tract symptoms, such as night time urination and poor urine flow. Of particular interest is that scientific review of evidence for the use of saw palmetto concluded that it decreases the symptoms of BPH, with few side effects and no changes to PSA levels. Saw palmetto does not artificially lower PSA levels, hence it is unlikely to mask the presence of prostate cancer. No added salt, yeast, gluten, wheat, milk derivatives, preservatives, artificial flavours or sweeteners. Started in Queensland, Australia in the 1930s, BLACKMORES improves peoples’ lives by delivering the world’s best natural health solutions, to become peoples’ first choice in healthcare. For over 80 years BLACKMORES has combined scientific evidence with traditional knowledge to offer people a more natural approach to health. As Australia’s leading natural health brand, BLACKMORES' products are developed by a highly experienced and dedicated team of formulators including naturopaths, chemists, scientists and product development pharmacists. BLACKMORES experts use the highest quality ingredients from around the world and made to exacting requirements under the international Pharmaceutical Inspection Convention and Pharmaceutical Inspection Co-operation Scheme (PIC/s) standards of good manufacturing practice (GMP). Trust has to be earned not bought and we recognise that consumers put their trust in us when it comes to their health.